Fellow GoAnimator, TheseStars is a big supporter of Cool Froyd putting aside quite a great deal of time to create a new GoAnimation analyzing Froyd's star charts to determine what his Sun sign might be. As well as Froyd the video features TheseStars (as a whiteboard character), Stick Figure and Hoot the owl - a character that I animated for TheseStars using Koolmoves. Watch the video below and then read on. Don't be put off by the length, those nine minutes will fly by! The video wasn't intended for public viewing, or at least TheseStars was never quite sure about whether I'd want it made but public. However with so much work put into it, combined with an interesting way to present and analyze star charts, letting more people see it was more a question of why not? There's a lot of custom work her including all those chart symbols, and Froyd's eye movements (not to mention that Hoot is a completely custom character too). Personally I like watching how TheseStars brings Hoot to life with her voice work and the way she combines all those actions for Hoot that I created. That said, it's also interesting to hear all about the meanings of the various different symbols and how they relate back to Froyd. 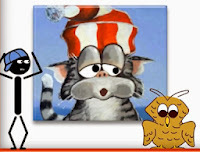 If you've enjoyed Hoot, Stick Figure and TheseStars in this animation then you can see them in several other animations on TheseStars website Videos From the Heart - you may like to order an animated slide show of memories whilst you're there. Could be a great holiday gift idea! You may also like to buy a Cool Froyd or Hoot gift item from my CafePress Store. American Cartoonist, Eric W. Schwartz, (whose unofficial Amiga Icon, Amy the Squirrel, is pictured on the July 92 edition of CU Amiga cover on the right) is my only real animation hero. Sure there are the big names like Disney, Chuck Jones, Tex Avery and even Preston Blair whose influences can all be seen in my own cartoons but Eric did what none of the others could. He showed that really great 2D computer animation was within my reach with little more than an Amiga Computer, a copy of Deluxe Paint and Moviesetter. This was at a time when computer based animation was in its infancy (outside of computer game animation) and Flash was something that lights did. There were many great Amiga artists but Eric was really the only one consistently making very funny, traditional style animations. His humor and drawing style is heavily influenced by classic Warner Brothers and Disney cartoons but he managed to build on this, creating something that was recognizably Eric's own style. Reallusion's CrazyTalk Animator 3 or Smith Micro's Moho Studio Pro 12. Which of these 2D animation applications is right for you? Regular readers of this blog will know I'm a strong supporter, and fairly proficient user of CrazyTalk Animator since version 1. It's a great piece of software for producing 2D animations from purchased content quickly and, with version 3, is easier than ever to create animations from your own art. Lesser known is that I first purchased Moho Studio Pro 12 (then known as Anime Studio Pro 9) back in October of 2012 and have been upgrading it to the latest version ever since because I believed in it as an application for creating great 2D animation to TV quality standard. As such, it's a much more complex application than CTA3 that I only got around to learning properly late last year. I'm still in the process of blogging my progress. Previously I've shown you how to animate your artwork with Reallusion's CrazyTallk 8, an app designed to make the creation of talking head style animations easy and quick. In this article I'm going to take the same Cow's Tail artwork and animate it with Reallusion's CrazyTalk Animator 3 (Pipeline Edition) just to show you the additional animation options that this application can bring to your production. Note: At the time of writing Reallusion is weeks away from launching Cartoon Animator 4, the next iteration of CrazyTalk Animator which has been rebranded to better reflect its ambition as a complete 2D animation studio. Everything discussed in this article can be done in Cartoon Animator 4. Voice Changer by AVSoft is real time voice manipulation software that can be used for a wide range of purposes including (according to their website); Voice-over and voice dubbing for audio/video clips, presentations, narrations, voice messages, voice mails, E-greeting cards, broadcasting, etc. ; mimic the voice of any person, create animal sounds, change/replace/remove voices in songs, videos,etc. I bought it for the specific purpose of changing my own voice, to extend my vocal range, for voicing characters in my own animations. I was fortunate enough to get this software at a significant discount that made it difficult to refuse, given that I'd never tried it, or even heard of it before. I'm not sure if I would have bought it at the full price given that much of what it can do (for my needs) can also be done with the freeware audio program, Audacity. This week Smith Micro released the latest version of it's animation software, Moho Pro 12, which is actually the latest, completely revised and updated version of Anime Studio Pro 11 with a new name, kind of. As I understand it Anime Studio used to be called Moho in the beginning and this is a return to the original name. I firmly believe in this software as a professional animation tool, as evidenced by the fact I've kept upgrading every time they release a new version, despite never having the time to even scratch the surface learning how to use it properly. CrazyTalk Animator 3's bold claim is 'The One-for-all 2D Animation'. Does it deliver? Could it be your 'go to' 2D animation tool of choice? Before I explore those questions I feel a bit of backstory is necessary. I've been using Reallusion's CrazyTalk Animator since its original incarnation that promised quick and easy, 2D animation creation. An idea that was relative depending on what kind of animation you wanted to do. Since my focus has largely been on original character animation my experience with CTA is relative to that. If you wanted to create animated characters from your original artwork, quick and easy didn't really describe the time and effort involved. There was a lot of preparation and considerable time spent rigging its G1 characters. Creating a character rig from original art can seem like a daunting task in CrazyTalk Animator 3. Especially if, all you really want to do is put together a quick animation with characters you may never even use again. Here's how to rig a CrazyTalk Animator 3, G3 human character, with the fewest components, whilst still being compatible with G3 character motions, and having a face capable of lip syncing and character expressions. You should be able to do this in under an hour - assuming you have your artwork ready to go.